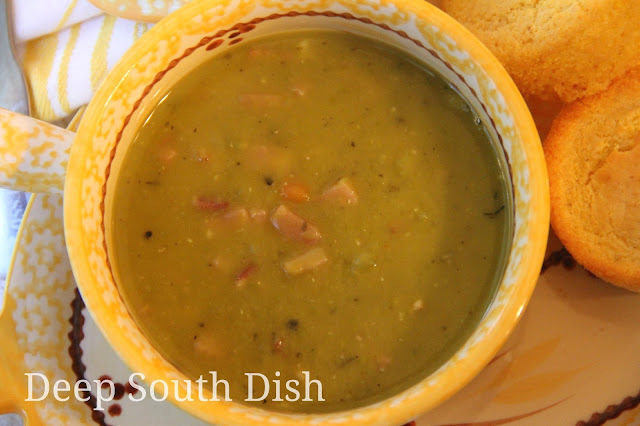 A classic soup combining dried split peas and ham, with a mirepox of onion, carrots and celery, enhanced with a ham bone or ham hocks. As much as I look forward to all those delectable holiday dishes that we wait all year to eat, I tire of it all pretty quick. By a day or two later, I usually start craving simple things like egg salad or grilled cheese and tomato soup, and anything that hasn't been consumed is destined for the freezer, where it will be re-purposed in another way, another day. The turkey carcass is destined for a soup or gumbo, the turkey that survives beyond the sandwiches, gets used in casseroles or pasta dishes or goes to the freezer, and the ham bone becomes stock for soup or beans, or gets frozen for later. 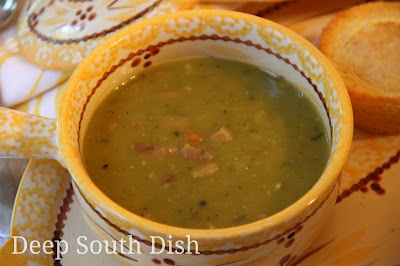 This soup is a wonderful way to use that ham bone and some of that leftover ham you set aside. If you have the time, make a nice stock from the ham bone first, or, if you don't have a bone, a couple of meaty ham hocks will stand in nicely too. The base will give a boost in the smokey flavor of the soup, though it's not necessary to still have a mighty fine pot of soup using chicken stock or broth, or even if you use plain water with a little chicken base or bouillon. The dried peas in split pea soup are cooked down until they mostly disintegrate, forming a thick soup. Lots of folks like to puree it from that point until the soup itself is completely smooth. Make sure you do that before adding in the meat from the ham hocks and the chopped ham. I don't bother because it breaks down enough for me, and I like the added texture from the peas that don't myself. I like to use Camellia dried peas for this. That probably doesn't surprise anyone, since it's my recommended and most favorite brand of dried beans and peas - reliable, trustworthy and delicious! Rinse and sort through the peas to pick out any debris or rocks that found their way in there. Cook the bacon in a soup pot, until fat is rendered but not until it is crisp. To the bacon and drippings, add the chopped onion, celery and carrot; cook over medium until tender, about 5 minutes. Add the garlic, cook another minute. Add the peas to the pot, along with the herbs. Cook and stir another minute, then add the ham or chicken stock, Liquid Smoke, if using, ham hocks and bay leaf. You may substitute plain water if you prefer, but also stir in some bouillon or chicken base, like Better than Bouillon. I used 2 tablespoons. Bring to a boil, reduce heat and simmer uncovered on very low for 1 hour, stirring occasionally. Add the ham to the beans and low simmer for 30 minutes longer or until peas are tender and have broken down. Soup should be very thick. Remove bay leaf and discard. Add salt, pepper and Cajun seasoning; taste and adjust seasonings as needed. Serve with cornbread or corn muffins. Cook the bacon in a soup pot, until fat is rendered but not until bacon is crisp. To the bacon and drippings, add the chopped onion, celery and carrot; cook over medium until tender, about 5 minutes. Add the garlic, cook another minute. Rinse and sort through the peas, add to the pot, along with the herbs and bay leaf. Cook and stir another minute, then add the stock or water, Liquid Smoke, if using, and ham hocks. Bring to a boil, reduce heat and simmer uncovered on very low for 1 hour, stirring occasionally. Add the ham to the beans and low simmer for 30 minutes longer. Peas will have broken down and soup should be very thick. Remove bay leaf and discard. Add salt, pepper and Cajun seasoning; taste and adjust seasonings as needed. Cook's Notes: May serve as is, or if you prefer a smoother texture, puree with an immersion blender or carefully transfer in batches to a food processor before adding in the ham. If you have the extra time and for a boost in flavor, use a leftover ham bone or a few meaty ham hocks to first make a ham stock as your soup base. Water may be substituted but add in 2 tablespoons of chicken base with the soup. Pick meat off of the bone or hocks and use in the soup. May omit Liquid Smoke if using a homemade ham stock. In place of the thyme and rosemary, I use a teaspoon of Herbes de Provence. Instant Pot/Electronic Pressure Cooker: Add bacon and cook veggies in bacon drippings as above. Add the herbs, ham bone or hocks, and 6 cups ham or chicken stock, seal and cook on high pressure for 15 minutes. Let pressure release naturally, remove bone or hocks and pick off meat, adding back to soup along with the 2 cups of chopped ham. Stir, taste, adding salt and pepper as needed. 24 HUNGRY PEOPLE COMMENTED. ADD YOURS! Gosh, Mary, I'm the same way. I don't want anything richer than soup right now either. I love split pea soup because I love the flavor but also because my husband doesn't care for it so I can eat off it for a long time. I freeze it in individual portions. Your's look delicious, as always. I do the same Jackie! How would I cook this in my crockpot? Prepare as above and put everything in the crockpot - low for about 9 hours or high for about 6 should do it, until the peas break down & become creamy. You could also skip the saute & just dump it all in - a lot of recipes do that. At the end, remove the bone or hocks, pick off the meat and return it to the CP until heated through. I made this last night and we both loved it. Served it with yeast rolls and that was dinner. Simple but satisfying. I'm so glad y'all enjoyed it Joe & thanks so much for stopping back by to let me know! Oops! Because I do all of my own manual html website coding myself & I forgot to add the code to this recipe before I published it. I didn't even notice! Sorry about that & thank you for letting me know so could fix it! Thanks for fixing that recipe. Appreciate it. I made this soup yesterday for dinner & it was delicious. I had saved some ham stock & ham in the freezer from a spiral cut ham we had for Christmas & used that along with a can of chicken stock & one bouillon cube in water to make up the 7 cups of liquid. I didn't have rosemary or the Cajun seasoning but added the thyme. The only thing I will do next time is reduce the thyme as I thought it was too much for my taste. I'll try to find the Herbes de Provence & use that next time. I served this delectable soup with corn bread muffins. My husband raved over the taste which is funny because when I told him what I was making, he said, "I don't think I'll like it." Next time I'll make it in the crockpot overnight. I often do this with recipes & you awaken to wonderful smells in the house. Thanks again, Mary, for a wonderful recipe. You're so welcome Tricia - glad y'all enjoyed it! Mary; I love split pea soup, especially when accompanied by a fairly thick slice of Vidalia onion sandwiched between 2 slices of sharp cheddar, sandwiched between 2 slices of homemade sourdough bread, slathered with a little country mustard, then thrown into a Panini press. Our ingredients and methodologies are almost identical. I too make a stock to begin with. I wish I cold get my wife to do that. The rule is that she gets to cook on the weekends. She loves to make soups and stews, especially on cold weekends like this one. I’m going to print this out for her. Maybe she’ll follow your recipe. She doesn’t follow mine. She just throws everything in the pot and hopes for the best. It doesn’t always end well. I chop my veggies a little on the rough side. I make my stock then remove everything from the pot except the carrots and some of the onion. After the peas are done, I hit everything with the immersion stick blender; then add the chopped ham and bacon to the pot. If it needs a little extra oomph, Better Then Bouillon makes a pork base that’s pretty good. BTW, my wife uses Vidalia onions in this. Between the carrots and the Vidalia onion, it makes it way too sweet. Don’t do it. I know your recipe doesn't mention it but I was just wondering whether it was necessary to soak the peas overnight prior to making the soup. I don't, but then I like to allow them to cook low and slow and break down that way. You can reduce the cooking time by soaking though. I didn't see it in the recipe but I wanted to ask whether it is necessary to soak the peas overnight prior to making the soup? Oh my! I can't wait to try this! I already know it will be delicious! I just made this today and it came out great! I'm sure it would've been better if I had bacon but it still tasted amazing. Thank you so much & I'm so glad that you enjoyed it. Thank you for taking the time to stop back by and let me know! You're welcome Andy!There is just something different about the beans from Camellia brand, so I just stick with a good thing! I hope that you enjoyed the soup - could go for a bowl right now myself, it's cold today!